Though we missed this year’s rose harvest by just a few weeks, we’ve still been savoring the sight of beautiful blooms in the gardens of homeowners in Kalofer, a tiny town in the central part of Bulgaria. For more information about Bulgaria and its annual rose harvest, see the Bulgarian National Tourism Board site, keeping in mind that the city of Kazanlak is generally considered the center of the action. Need more inspiration? This link contains an index of all my posts from Bulgaria. Do you like collages? From windows of the world, to fancy horse tails and delectable Spanish appetizers, take a peek at my collage series. Interesting that only red and pink petals are used for making oil. The gardens must be quite showy. Our current ‘home away from home’ village is a bit rural (one local told us 75% of households might have their own livestock in a barn / courtyard behind their home). Unfortunately, like much of rural Bulgaria, the village is a bit economically-depressed. Many of the locals maintain their yards quite beautifully, with geraniums overflowing in pots, and rose bushes galore. Be still my heart. How dreamy. So surreal. A landscape of nothing but roses. The fragrance would be heavenly. V.
Virginia, perhaps we can both meet here next summer for the celebrated harvest. :) The locals we’ve met in this tiny village told us that a few decades ago, there used to be a rose oil distillery. They sang folk songs referencing this tiny village and the aroma of its roses in the air, and described how the colorful blooms used to ride down in the stream’s waters. Unfortunately the distillery here has since closed, but the famed Rose Valley is not far away. I wish we’d been here just a few weeks earlier, for now we can only see the bloom-less bushes. They are beautiful in their own way, though, framed by this area’s dramatic mountains. Agreed about the statistic, Neely. While the rose harvest sounds and looks romantic in the images I’ve seen, it would be hard work picking all those petals by hand. No wonder why the oil is so treasured and pricey. Beautiful Tricia, almost can smell their soft fragrance. I didn’t know that Bulgaria is part of a bulk supply for roses. Roses just somehow do something to my soul, can’t quite explain it, what it triggers within me. I had photographed some roses in a post a while ago. Maybe you can check it out. Happy travel times to you! Cornelia, thank you for the travel wishes and for sharing your reflections on what make roses special. Perhaps one of these summers when you visit Garmisch, you can make a detour to Bulgaria for the Rose Harvest? We arrived too late to enjoy it this year, but we befriended a German-Bulgarian woman from Berlin who annually leads tours here. She takes her clients to the rose fields, and for several days they make their own cosmetic products using the rose oil. Just yesterday we rode a train through the country’s Rose Valley, and while the bushes were rose-less, sunflowers were there to greet us. Despite the grey skies overhead and the rain that trickled into our cabin, it was a pleasant ride through some very pretty landscapes. 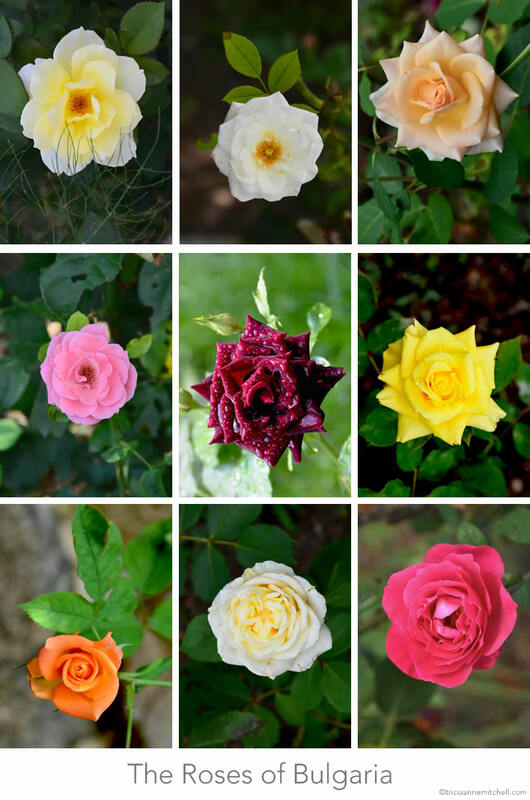 Beautiful series Tricia ~ the rose in the middle, perfect and my favorite ~ each of them different and special. Thank you, Randall, or as they say here in Bulgaria – blagodaria. :) My head is swimming with Cyrillic characters as I type, and the memory of the rustic gardens in which I photographed these roses. I was also drawn to that one in the center, and its pretty velvet petals dressed in the rain drops that have been quite common in Bulgaria this summer. Hope you’ve had a lovely weekend in your corner of the world! The look of Cyrillic characters have always fascinated me…Bulgaria is now another target of travel for me thank to you :-) Cheers! A “target of travel.” I like that, Randall. :) Glad to point you in the direction of a country with so much potential. I hope to do a post on the village of Kalofer someday soon. The mountain scenery there was picturesque, but the people were the stars. We felt as though we had a little farewell committee as we rolled out of town with our luggage. The Bulgarian sense of hospitality and willingness to help are something we’ve noted throughout our journeys here. I like the image you painted with the words “a little farewell committee as we rolled out of town…” Those types of connections with people are what I think we hope to always feel. Wonderful, and look forward to that post! Cheers. Terri, our repertoire of Bulgarian words is still growing, so we haven’t been able to have in-depth conversations about the grandmothers’ secrets for growing their stunning roses. Miming and smiles have been popular communication tools, though. :) It’s been an unusually rainy summer in Bulgaria, according to our guesthouse hosts, and unfortunately some locals have told us that their crops (tomatoes and grapes) have suffered as a result. Here’s hoping the lavender and rose harvests weren’t adversely impacted. Interesting that you should mention that your father liked using eggshells and coffee grounds to fertilize. When we lived in Heidelberg, we used to add coffee grounds to the plants in our window-boxes and the herbs did seem quite happy. Always fun to hear from you, Terri. Hope you and James are having a wonderful weekend! Roses are my favourites and I’ve just pruned and fertilised mine in anticipation of a lovely springtime display. I hope they look as beautiful as the ones in your photos. The scent at harvest time must be wonderful. Carol, we missed the harvest in Bulgaria this year, but the locals assured us it’s wonderful. One night at dinner, some new Bulgarian friends sang us a song about how aromatic their village used to be at rose harvest time. It sounds as though you have a pair of green thumbs! Here’s hoping you’ll have happy roses. Do you have any favorite varieties? My favourites in the garden are Julia’s Rose, which is a lovely parchment colour and Double Delight, which is cream and pink. Gorgeous. Carol, I just took a peek at those two types – each quite different, but both very pretty. The Double Delight reminds me of a more vivid version of the Peace Rose, a favorite of my mom’s garden when I was a child. I once read about gardeners hybridizing their own roses. Sounds fascinating and fun!